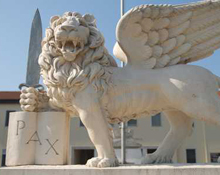 The U.S. Army Garrison Italy headquarters is located on Caserma Ederle in Vicenza, Italy. Vicenza has a population of approximately 112,000 people and lies at the foot of the Dolomites in northern Italy. It is the capital of the Vicenza province in the Veneto Region. It is situated midway between Venice and Verona and is within a 3-hour drive from Florence, Milan, and Bologna.